For some this seems very hoaky I’m sure. But yesterday I spent six and a half hours at the Bonnet House’s lovely enclosed courtyard working on my second painting. I chose, as my subject, a photograph I took a few years back of one of my garden Japanese Anemones. I can easily say I was exhausted when I got home; my brain was worn out. I literally spent the day thinking, studying this tiny flower. Every petal, every shadow, every curve and curl was studied and mentally dissected for detail. The leaves in the background were studied just as intently for color and light/shadow. My teacher showed me how to make the other buds and blooms fade out of focus. Hours were spent on each petals. The flower showed pollen spilling onto the pedals; it would soon be time for it to enter it’s next stage of life as a seedhead. As I spent this time I appreciated the beauty, the gracefulness of this creation. It is one of the last of season’s blooms in Chicago along with the Asters. 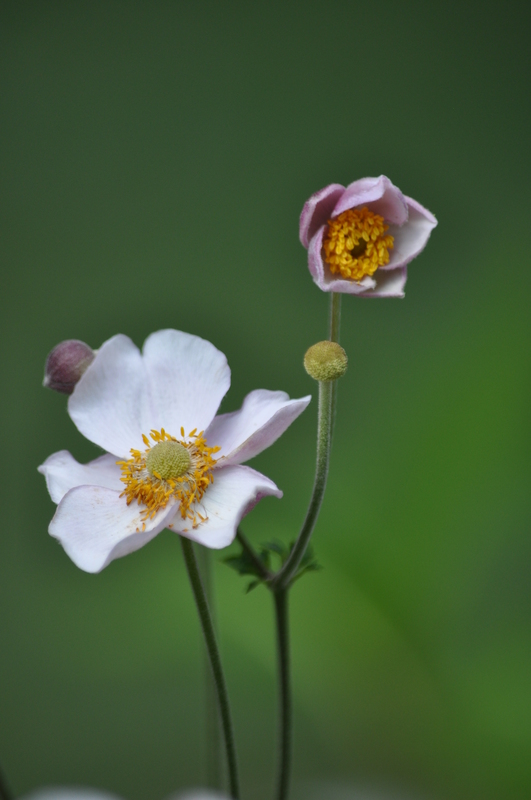 The Japanese Anemone is an agressive plant requiring me to tame it’s appearance in my garden to places of my design. Over the years I removed many “volunteers” that tried entering other areas of the garden. But the quiet beauty, the graceful elegance of the flowers always overcame any bad aspects of the plants. I no longer have a private garden; we downsized to a lovely condominium. Fortunately Chicago’s Lincoln Park includes Japanese Anemone in it’s mix of perennials. While I sit here in Florida gazing at this Japanese Anemone I still a drawn to it’s subtle, simple, design. Evidence of one more miracle. The painting has elements of being done by a beginner. For me the joy was the process of creation, trying to capture it’s natural beauty and specialness. A blessed Passover and Easter to all.